The Dominion of New Zealand is the historic predecessor to the Realm of New Zealand. Originally administered from New South Wales, New Zealand became a separate British Crown colony in 1841 and received a large measure of self-government following the New Zealand Constitution Act 1852. New Zealand chose not to take part in Australian Federation and assumed complete self-government as the Dominion of New Zealand on 26 September 1907, Dominion Day, by proclamation of King Edward VII. Following the 1907 Imperial Conference, the New Zealand House of Representatives passed a motion respectfully requesting that His Majesty the King "take such steps as he may consider necessary" to change the designation of New Zealand from the "Colony of New Zealand" to the "Dominion of New Zealand". The alteration in status was stirred by a sentiment on the part of the Prime Minister of the self-governing colonies of the British Empire that a new term was necessary to differentiate them from the non-self-governing colonies, such as (at that time) Fiji. The adoption of the designation of Dominion would, "raise the status of New Zealand" stated Prime Minister Joseph Ward and "...have no other effect than that of doing the country good". The change was opposed by Leader of the Opposition Bill Massey. 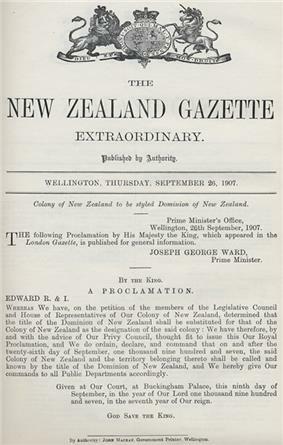 The proclamation on 26 September 1907 announces the 'Colony of New Zealand to be styled Dominion of New Zealand'. A Royal Proclamation granting New Zealand Dominion status was issued on 9 September 1907. It read - "Edward R. & I. Whereas We have on the Petition of the Members of the Legislative Council and House of Representatives of Our Colony of New Zealand determined that the title of Dominion of New Zealand shall be substituted for that of the Colony of New Zealand as the designation of the said Colony, We have therefore by and with the advice of Our Privy Council thought fit to issue this Our Royal Proclamation and We do ordain, declare and command that on and after the twenty-sixth day of September, one thousand nine hundred and seven, the said Colony of New Zealand and the territory belonging thereto shall be called and known by the title of the Dominion of New Zealand. And We hereby give Our Commands to all Public Departments accordingly. Given at Our Court at Buckingham Palace, this ninth day of September, in the year of Our Lord one thousand nine hundred and seven, and in the seventh year of Our Reign. God save the King." Dominion status allowed the dominions to become virtually independent, while retaining the British monarch as head of state, represented locally by a governor-general appointed in consultation with the Dominion’s government. Control over defence, constitutional amendments, and (partially) foreign affairs remained with the British government until the Statute of Westminster was adopted. In 1907 new Letters Patent were issued to mark New Zealand’s change in status from a Crown colony to a Dominion, declaring that: “there shall be a Governor and Commander-in-Chief in and over Our Dominion of New Zealand”. This event passed relatively unheralded. It attracted little comment. This illustrates that what may appear as a constitutional landmark, particularly from this point in time needs to be seen in its context. And so, although new Letters Patent and Royal Instructions were issued in 1907, and the requirement to reserve certain classes of Bill for His Majesty’s pleasure was omitted, New Zealand certainly didn’t embrace dominion status with the vigour of a young nation intent on independence. There was a competition to create the first national arms. In 1917 Letters Patent were issued again re-designating the title Governor to Governor-General of New Zealand. 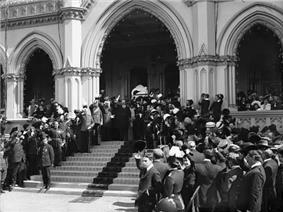 The changes in the Governor-General’s title were intended to reflect more fully New Zealand’s self-governing status. The 1917 Letters Patent constituted the office “Governor-General and Commander-in-Chief in and over Our Dominion of New Zealand”. Until 1911 New Zealand used the Coat of Arms of the United Kingdom on all official documents and public buildings, however following Dominion status a new Coat of Arms of New Zealand was designed. Despite this new status, there was some apprehension in 1919 when Prime Minister Bill Massey signed the Treaty of Versailles (giving New Zealand membership of the League of Nations), which indicated that New Zealand did have a degree of control over its foreign affairs. Massey was unequivocally an Imperialist, and fervently supported the British Empire. The Balfour Report further resolved that each respective Governor-General occupied “the same position in relation to the administration of public affairs in the Dominion” as was held by the Monarch in the United Kingdom. The only advisers to the Governor-General and the Monarch in New Zealand were his New Zealand Ministers. Prime Minister Gordon Coates, who led the New Zealand delegation to the 1926 Conference, called the Balfour Declaration a 'poisonous document' that would weaken the ties of empire. At the 1930 Imperial Conference, the conclusions of the conference were re-stated, and Sir Thomas Sidey obtained a clause exempting New Zealand from the Statute of Westminster until such time as it should be ratified by the Parliament of New Zealand. Tokelau, previously under the sovereignty of the United Kingdom, became a part of New Zealand on 1 January 1949. Ross Dependency, previously under the sovereignty of the United Kingdom, is today regarded by New Zealand as having become part of New Zealand on 16 August 1923. The legality of that contemporary assertion has been questioned but is nonetheless the position of New Zealand. In addition, only 4 other countries in the world have formally recognised New Zealand's claims to the territory. The Cook Islands and Niue each already formed part of the Dominion of New Zealand on the date it was proclaimed. Both had become part of the Colony of New Zealand on 11 June 1901. Western Samoa was never part of New Zealand, having instead been the subject of a League of Nations Mandate and subsequently a United Nations Trusteeship Agreement. To mark the granting of Dominion status, 26 September was declared Dominion Day. Today, it is observed only as a Provincial Anniversary Day holiday in South Canterbury. There is support in some quarters for the day to be revived as an alternative New Zealand Day, instead of renaming Waitangi Day, New Zealand's current national day. The Wellington newspaper The Dominion (now The Dominion Post) was first published on this day in 1907. In 1931, the British Parliament passed the Statute of Westminster, which confirmed complete autonomy for its dominions, and gave effect to resolutions passed by the imperial conferences of 1926 and 1930. Preferring the United Kingdom to handle most of its foreign affairs and defence, New Zealand held back from adopting the Statute of Westminster Act, and, 16 years later, was the last dominion listed in the Statute to do so. The National opposition prompted the adoption of the Statute in 1947 when its leader, and future Prime Minister Sidney Holland introduced a private members' bill to abolish the New Zealand Legislative Council. Because New Zealand required the consent of the Parliament of the United Kingdom to amend the New Zealand Constitution Act 1852, Prime Minister Peter Fraser decided to finally adopt the Statute. The Statute was adopted on 25 November 1947 with the Statute of Westminster Adoption Act 1947, along with consenting legislation from the British Parliament, meaning the British parliament could no longer make ordinary law for the dominion, other than at New Zealand's request and consent. In 1946 Prime Minister Peter Fraser instructed Government departments not to use the term 'Dominion' any longer. However, there was no proclamation that the official status of New Zealand had been changed from Dominion of New Zealand. Furthermore, the proclamation of 1907 was not revoked or amended. The term Dominion gradually fell into disuse after 1953, and has been rarely used since the 1970s. Today the Realm of New Zealand comprises New Zealand, Tokelau and the Ross Dependency, and the self-governing states of the Cook Islands and Niue. Former Dominions of the British Empire that have the British Monarch as their Head of State (including Canada and Australia) are known as Commonwealth realms. ^ Whether New Zealand's status as a British dominion came to an end in 1947 with the enactment of the Statute of Westminster Adoption Act 1947 is unclear. For a discussion, see the relevant section of this article.